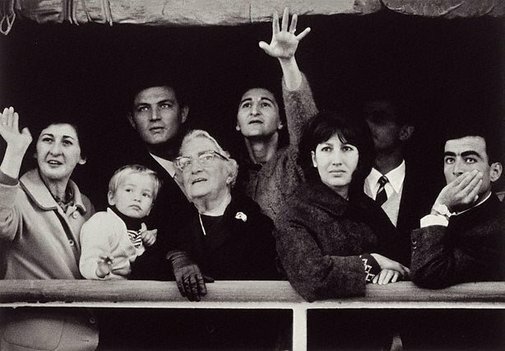 Moore’s first colour image ‘Faces mirroring their expectations of life in the land down under, passengers crowd the rail of the liner Galileo Galilei in Sydney Harbour ‘was published in ‘National Geographic’ in 1967.1 In that photograph the figures are positioned less formally and look cheerful. But it is this second image, probably taken seconds later, which Moore printed in black-and-white, that has become symbolic of national identity as it represents a time when Australia’s rapidly developing industrialised economy addressed its labour shortage through immigration. The strength of the horizontal composition of cropped figures underpinned by the ship’s rail is dramatised by the central figure raising her hand – an ambiguous gesture either reaching for a future or reconnecting with family. The complexity of the subject and the narrative the image implies ensured its public success, which resulted in a deconstruction of the original title, ‘European migrants’, by the passengers, four of whom it later emerged were Sydneysiders returning from holiday, alongside two migrants from Egypt and Lebanon.2 Unintentionally Moore’s iconic image has become an ‘historical fiction’, yet the passengers continue to represent an evolving Australian identity in relation to immigration. Signed and dated l.centre verso, pencil "... 1966 David Moore". Georgina Cole, Look , 'Australian photographs past and present: What they say about the people and the country', pg. 26-30, Sydney, Mar 2015, 30 (illus.). Bruce James, Art Gallery of New South Wales handbook , 'Australian Collection: Australian Photography', pg. 198-207, Sydney, 1999, 205 (illus.). Rose Peel, Photography: Art Gallery of New South Wales Collection , 'Australian postwar photo-documentary', pg.189-207, Sydney, 2007, 194, 204 (illus.). David Moore: Australian Photographer Vol 1 , McMahons Point, 1988, 123 (illus.). The photograph and Australia , Sydney, Jun 2015, 105 (colour illus.). The Sydney Morning Herald , Sydney, 06 Nov 1993, 12 (illus.). Great collections , Sydney, 2008, 102 (colour illus.). Shades of Light - Photography and Australia 1839-1988 , Sydney, 1988, 129 (illus. ).